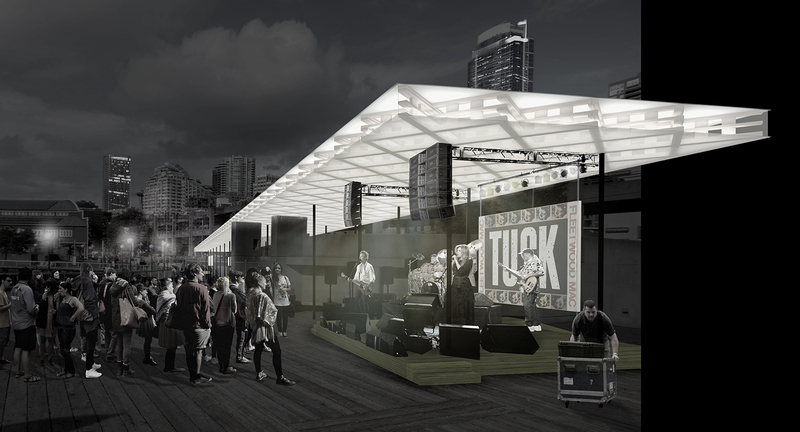 University of Washington architecture students will design and build a new temporary event pavilion and Internet hub for the Seattle waterfront. The structure will be called the Hotspot Pavilion and is scheduled to be ready for three years of use starting in summer of 2015, helping draw people to the area around Pier 58. This fall a group called Friends of Waterfront Seattle, with cooperation from the City of Seattle and the Seattle Parks Department, asked the UW Department of Architecture to design and build a new facility to serve as a community gathering place in the Waterfront Park area on Pier 58, between the Seattle Aquarium and the Seattle Great Wheel. 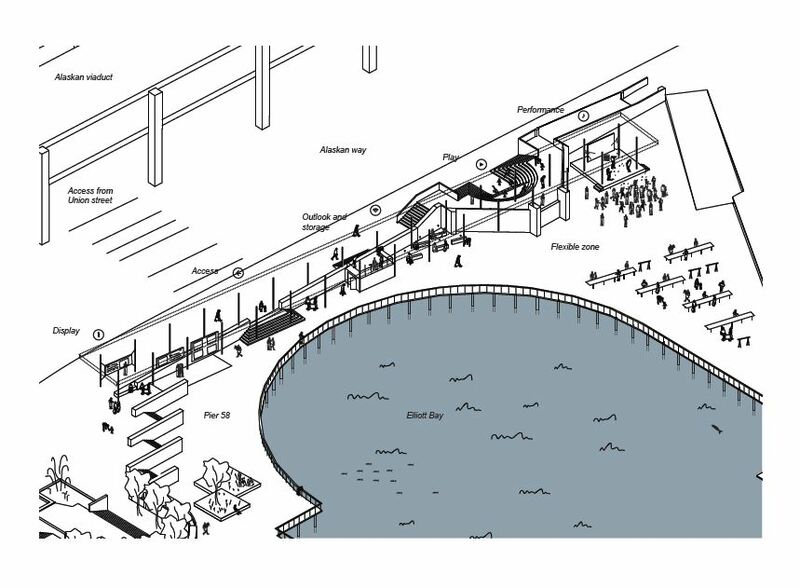 The groups wanted a venue for community events with an emphasis on music that might attract diverse audiences to the location as the city continues to transform its waterfront. In October, Peter Cohan, UW associate professor of architecture, convened a design studio class with 15 graduate students, who explored different concepts for the site. They then formed four teams based on the similarity of their ideas, and proceeded to create designs based on those concepts. The students researched materials, lighting, landscape development and construction feasibility and created scale models of their proposals. In late November, a design jury composed of UW faculty, representatives of Friends of Waterfront Seattle, the City of Seattle and others evaluated the four projects. They chose one called Edge. “Blue Urbanism: Inviting Urban Play on Seattle’s North Waterfront“: View new visions for the area as designed by 31 UW graduate students in landscape architecture, architecture, urban planning, civil engineering, and real estate.1400 Western Ave., Seattle. Through Jan. 12. Students of the Architecture 503 studio class created four designs for the Hotspot Pavilion. The chosen design, called Edge, was by Alden Mackey, Liv Ziska, Nicholas Ames and Joe Moriarity. – Modular, by Cale Wilber, Gabrel Gonzales, Daniel Novak and Mariam Hovhannisyan.Baygraph, by Doug – – Brandon, Brad Hutchinson, Claire Shigekawa Rennhack and Michael Riha. – Barnacular, by Carey Moran, Brian Murphy and Becca White. See below for comments from the student designers. In a document describing their design, the students wrote that Seattle is realigning its geography to better connect to its developing waterfront. That latticed roof will be pre-assembled at the UW and then trucked to the site, where UW students will put it all together. The north side of the pavilion will include information about the waterfront redevelopment. Spaces for “access, rest and play” will occupy the center and the south end will have a stage for performances. The site will provide free Wi-Fi for visitors. Funding for the project will come from donations to the Friends of Waterfront Seattle. Advising the student designers were Kimo Griggs and Kate Simonen, associate professor and assistant professor of architecture, respectively. The project will proceed under the direction of Griggs. The Hotspot Pavilion is intended to stay at its location for about three years, the designers wrote. Q: Have you ever designed something this big before? Alden Mackey: Yes we have, but those design exercises were largely academic in nature and didn’t focus nearly as much on the feasibility issues that this project brought up. Nicholas Ames: The funny thing is that this is probably the smallest structure we’ve been asked to design in the master of architecture program. Certainly it’s the largest thing that most of us have worked on that is actually going to be built. Q: Did the resulting design reflect what you had in mind when you started? Mackey: We all approached this project from different directions, but shared common goals in how to execute the client’s vision for a pavilion on the waterfront: a structure that was iconic, versatile, functional and buildable. Ultimately, we all felt the design we presented was an accurate representation of our thoughts about the project and fortunately the Friends of the Waterfront Seattle felt the same. Ames: I think the final design — and I say final loosely since so many aspects will likely change in design development — is really far from where we started formally but reflects the ideas that we had been working with from the beginning. Q: How does it feel, knowing that what you design and work on will actually be built and used by folks in Seattle? Mackey: It’s a great honor for us as students and an excellent opportunity for the UW’s Department of Architecture to showcase its work and involvement with design in the city. Also, it’s important to keep in mind that this is only the first stage of the process and we still need to go through design development, construction drawings and assembly. But we’re all looking forward to it and excited about the experiences to come.